Nicole H. Hahn concentrates her practice in the areas of civil and commercial litigation, business transactions, family law, personal injury, bankruptcy, and traffic violations. The family law portion of Ms. Hahn's practice includes divorce, paternity, child custody, child support, child protection and guardian ad litem representation. Ms. Hahn earned her law degree from Saint Louis University in 2005 with certificates in international and comparative law from Saint Louis University and Université Libre de Bruxelles. 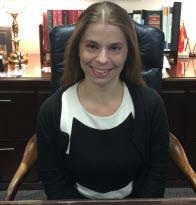 Ms. Hahn is licensed to practice in Missouri and Illinois.